Why perform The Merchant of Venice? The play has long been derided for its anti-Semitic content and for perpetuating the stereotype of a Jewish moneylender, so why include it in a contemporary Shakespeare festival? In Shylock, Warren Kimmel plays Jon Davies, a Jewish actor who has just completed his final performance as Shylock in a run of The Merchant of Venice that was cut short due to controversy. The play is structured as a talkback session where Davies explains why Merchant is in fact worthy of being performed and why he prefers to play Shylock as a Jewish villain rather than as a victim of persecution. Davies, in full Shylock costume, opens with the “if you prick us, do we not bleed?” monologue engendering sympathy. In this moment he is a helpless victim. But then Shylock talks about the pound of flesh that he wants to take from Antonio if his debt is not repaid. “If not for that pound of flesh, Merchant would be a family comedy,” Davies says. The usual defense for performing Merchant is “because it’s Shakespeare.” But Davies takes this further explaining that it is a work of art and it has value in and of itself. Even if Shakespeare was anti-Semitic and Merchant contains a character perpetuating anti-Semitic stereotypes, it is after all a work of literature taken out of its historical context. It is a work of art to be studied, not an example of how to live or an encouragement for an audience to go off and become anti-Semitic. As Davies gradually removes the layers of his Shylock costume, he unpacks the complex layers of meaning in Merchant. 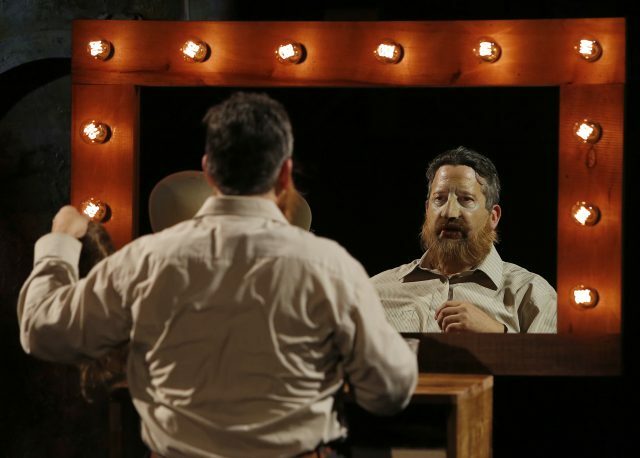 He sits in front of a large stage mirror and discusses his own complex identity as a Jew. He explains that “Jew” is but one layer of his identity and but one layer of Shylock’s character. In his performance, he hoped to find the essence of the character as written and thinks of Shylock as a villain first, a Jew second. In the format of a post-show talkback session, Shylock raises questions about the purpose of these types of sessions. As Davies says, a talkback is a way to tell the audience how they are supposed to interpret what they just saw in case they get the wrong idea. Sometimes this will be done as an introduction, a sort of apology or warning to let the audience know what they’re in for. But are audiences really in need of this hand holding to help them “process” what they have just seen? It’s easy to play Shylock as a victim, says Davies. But he’s convinced that it isn’t the way Shakespeare wrote the character. And yet, it seems that playing Shylock as a victim is the only acceptable option. Playing him as a villain draws strong criticism and public outcries of anti-Semitism. One impassioned audience member he describes calls him a “self-hating Jew” and spits on him. Anyone who has seen Merchant can see the hypocrisy inherent in this scene, and that is what Shylock is getting at. Finally, Davies comes to the point in his discussion where he explains that banning Merchant is a slippery slope. “First they came for The Merchant of Venice, but I’m offended by anti-Semitism so I said nothing,” he says. Why stop at Shakespeare? Why not ban literature by any author who was racist, anti-Semitic, homophobic, or misogynistic? Well, that would be most classic English literature. In his defence of Merchant, Davies is fighting for Shakespeare and for art itself. It’s a wonderful appeal for the importance of art and a treatise on sensitivity run amok. Davies references Anthony Burgess, who it is said on his death bed claimed that words and art are dangerous. Well yes, they are, and that might be the point of art — to provoke, to incite thought, and to uncover new ideas. Plays shouldn’t have to be comfortable for everyone in the audience. Davies, back in character for a moment, ends with the “pound of flesh” monologue: “The pound of flesh, which I demand of him, is dearly bought; 'tis mine and I will have it. If you deny me, fie upon your law!” Shylock is a consummate villain intent on exacting his revenge.